Bugs | Infonet Biovision Home. Several species of bugs feed on mangoes. Both adults and nymphs (young stages) feed inserting their needle-like mouthparts in young tissue, causing dieback and tip wilting. Other feed on the fruit, causing fruit fall and fruit deformation. It feed on fruits. Damaged young fruits show dark brown or grey indentations on the skin and normally drop. Bug feeding on mature fruit causes sunken lesions. 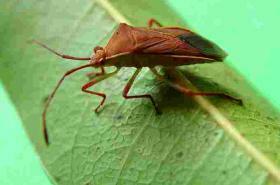 The coconut bug is reddish brown, about 1.5 cm long. Eggs are laid scattered over the fruit, small twigs, flowers and blossom stems. The young bugs are light brown with long thick antenna. They are large (about 2.5 cm long) bugs, and dark brown in colour. The hind legs of the male are enlarged. Both young and adult bugs feed on young flush, on the mid-vein of young leaves, or on flower stalks, causing wilting and death of new growth. 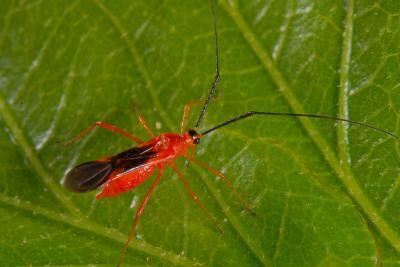 Heliopeltis bugs, also known as mosquito bugs are about 7-10 mm long and have slender bodies and long legs and antenna. Adults and young bugs (nymphs) feed on fruit and young shoots. Feeding on fruit causes dark lesions with a brown dark centre. Young shoots die back, resulting in vigorous secondary branching. 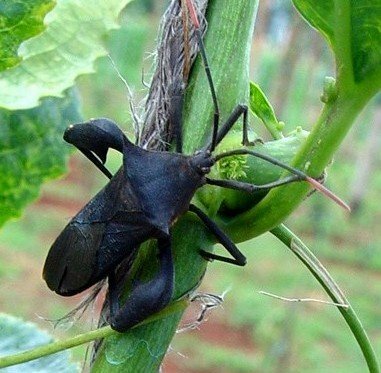 Bugs are difficult to control since they usually feed on a wide range of crops and are very mobile. Hand pick and kill bugs regularly, especially on young trees during flushing periods and during fruit development. Conserve natural enemies. Assassin bugs, spiders, praying mantises and ants are important predators of bugs. They kill or deter bugs. Weaver ants, tree-nesting ants common at the coast give effective protection against bugs. Also tree smoking may help against bugs.